Trek XO2 2008 - Good buy? I'm looking to get into the world of biking. Rather than spend full retail price within my budget for a new bike I was hoping to purchase a higher quality used bike for the same price. 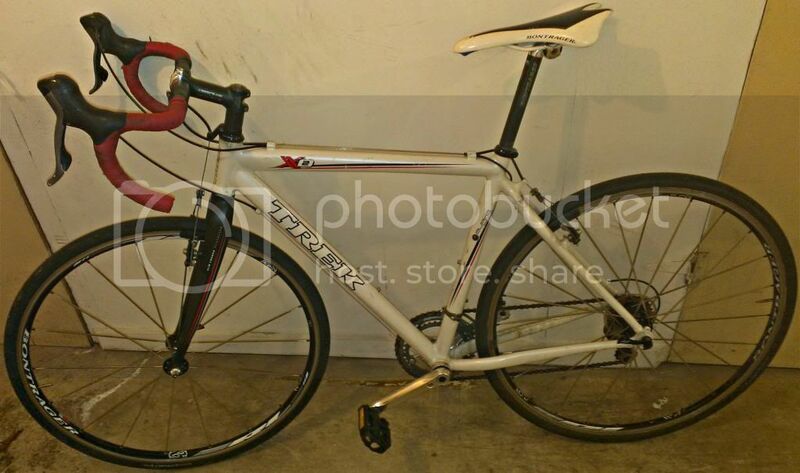 I've been scouring craigslist for awhile and have come across a 2008 Trek XO2 56cm cyclocross bicycle for $500 (could get for $450 or less) The bike has carbon fiber stem, seat post, fork - Bontrager race lite wheels, saddle and Ultegra components. I have attached below some pictures of the bike. I am 5'11" and think the bike would be a good fit. As I said I am newbie to the world of biking, but i'm looking for something to do some minor commuting and ride local bike paths. What are some things to look at when I view the bike and would it help to get any more info/pictures of certain components? i don't know what the 56cm in your description is in reference to, but looking at the length of that headtube, i would guess the effective seattube length to be about 50cm. but i'm sure that a number of pro's at 5' 11" could and do use a frame of that size, but most recreational riders at 5' 11" would buy a larger frame. i say this because frames where the toptube and downtube meet, like the one shown, before they reach the headtube usually have and effective seattube length of about 50cm or less, IME. You probably didn't get many responses because this isn't the right place to ask. I'm not sure where it would fit best, maybe the cyclocross section? Lots of people post these things in Classic and Vintage "What's it Worth?" although this obviously isn't classic or vintage. I have the same XO-2 in 54cm. I think that one's a 54cm also. It looks smaller than it is because it's a cross bike so the fork is tall and the head tube is short. The giant seatpost sticking out doesn't help. I think the price is fine and I'd expect it to sell but I think it's too small for you. At your height I'd suggest a 56cm minimum. Agreed on the price. But in regards to size, I'm just a hair shy of 5'10" and my 53 cm 'cross bike is almost too big for me. The top tube length is fine, but it's sporting the old school "fistful of seatpost" look. It's not a Trek XO-2, however, so you'd know that particular bike better than me. I'd say it's worth a look and a test ride to check the size. OP - I responded to your "visitor message." I assume since you only have two posts you weren't able to send me a PM. You bring up a good point, I think 'cross bikes fit larger. I'm 5'9" and my 54cm XO2 is on the large side as well. I would probably fit better on a 53 or maybe even a 52. I ride a 55cm road bike though. Fastjake makes good points. But if you get this bike PLEASE reposition the seat level. Andy. Bikes: Trek xo2, Fuji Cross Pro, Schwinn Traveler cross-conversion, Concours, Trek 2300, Takara, Specialized Hard Rock, Bianchi Campione D'Italia, GT LTS Team issue, BikeE, Miyata 110, and some others. Somewhere. But I hope you bought this bike. 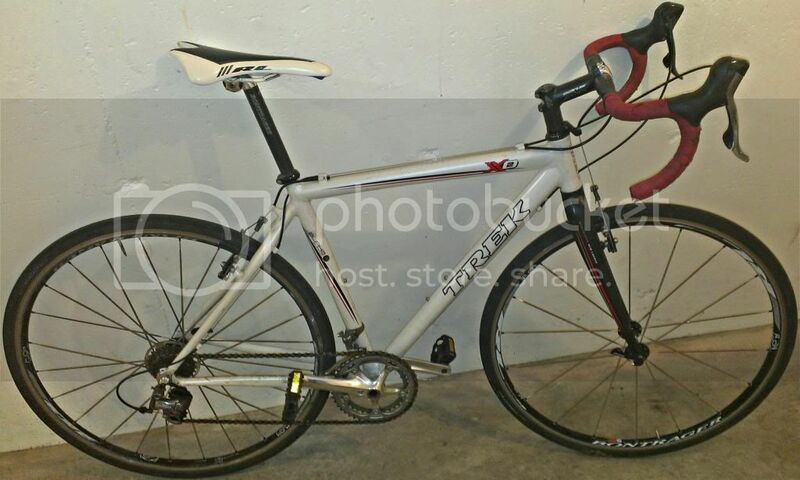 It's a great bike, pretty light, and $500 is a decent deal for this. It likely is a 56, but with the downward angle of the photo it makes it look a little odd. At 5'11", the 56 should be right on. That is my height and I have an identical XO2 in a 56 and it's works great for me. I ride it everywhere (road, CX, MTB trails) and swap out wheelsets according to terrain. Should you ever decide to part with it, please let me know.